My great-grandfather Frank Speck died 79 years ago yesterday – 7 April 1940 – in Monessen, Pennsylvania. I know much about his life in Monessen, yet almost nothing about him before he appeared around 1915. Frank and Elizabeth in 1915. Frank was born around 1886-1888 in Germany, although there is some speculation about his place of birth. His death certificate and funeral card both report his birth date as 21 May 1887. Frank married my great-grandmother, Elizabeth Linnemann, in January of 1915. Their marriage license application records that he was a hotel clerk living in Monessen, and he was born in Germany. His parents were deceased but named them as Peter and Agnes (no maiden name). Frank and Elizabeth’s daughter Agnes was born just over nine months after they married. I am fairly certain that Frank was working as a hotel bartender in nearby Manor (Westmoreland County) in 1910. My father remembers a time when he was young and his grandmother Elisabeth (Frank’s widow) had some papers out. He remembers seeing what would have been Frank’s birth certificate and said something to the effect of “He was born in Poland?” His grandmother put the papers away and never really answered him. I’ve gone through my parents’ pictures and records from my Dad’s family and haven’t been able to locate that birth certificate. My Dad said that his father tossed a bunch of old papers many years ago – ugh! The Speck Family circa 1927. I am hoping that using DNA data and matches could help me narrow down some possibilities for Frank’s family. Unfortunately, my father is the only living descendant of Frank (his son never had any children), so it may take a while or be difficult to weed out other ancestors. Frank’s obituary said that he was survived by a sister in Germany (unnamed). I really need to learn chromosome mapping and DNA Painter (I’ll report on that when I do!). Another place that I need to research further are Pennsylvania court records. I have found some newspaper articles about Frank and his company, which was involved in some lawsuits, plus a bankruptcy case. I wonder if any of those records may hold a clue or a more specific place of birth for Frank. Also, I need to take another look for local church records in Monessen. Frank’s origin is still a mystery … a brick wall that I plan to take down a little bit at a time. I’ll keep you posted of my progress. Which ancestor has you stumped?? The women in our families have likely done the majority of the cooking, and many of us have fond memories of a mother, grandmother, or auntie in the kitchen making a favorite recipe. My father remembers his grandmother Mem (Elizabeth Linneman Speck Merz) making City Chicken as a child when they lived in Pittsburgh. City Chicken actually isn’t chicken, but cubed beef, pork and/or veal on wooden skewers to resemble drumsticks. This recipe may have originated in Western Pennsylvania, and was popular in other areas of Pennsylvania, Ohio, Michigan, and Western New York. Early recipes for City Chicken show up in the 1930’s post-Depression Era. Chicken was costly or hard to find, while the other meats (especially pork) were generally cheaper. bake at 400F until the meat is done (not sure how long)- just test it with a fork. I don’t have a picture of our City Chicken (I will be sure to take one next time we have it!). 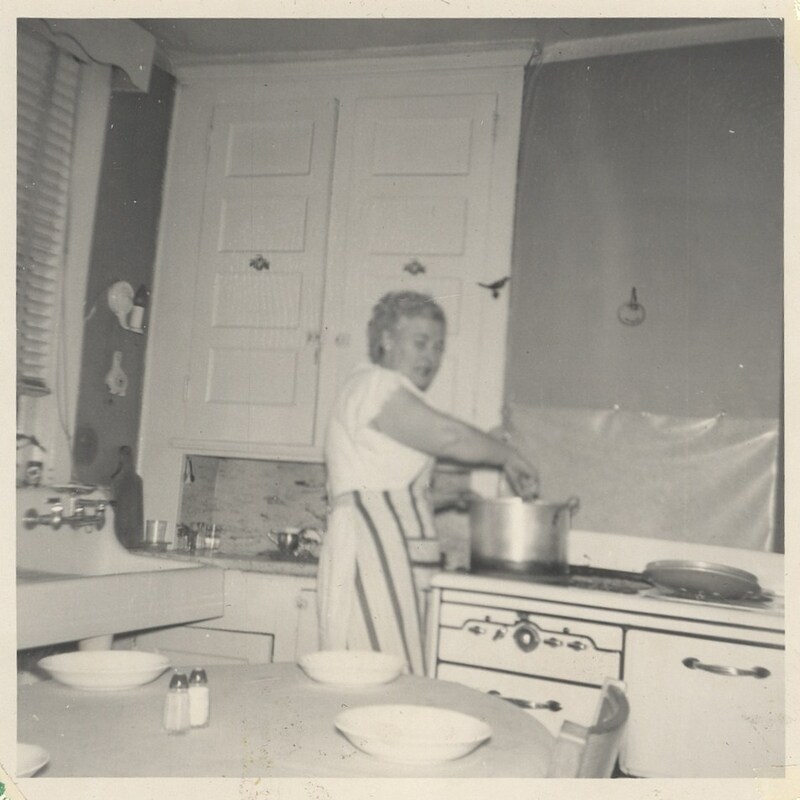 Instead, here is a picture of Mem in her kitchen – probably when she lived on Thelma Street in Pittsburgh. “City Chicken” in McCanns advertisement, The Pittsburgh Press, 1 November 1932, p. 6, col. 2; digital image, Newspapers.com (https://www.newspapers.com : 26 March 2019).